The facility, designed by Max Abramovitz, was originally named Philharmonic Hall and was renamed Avery Fisher Hall in honor of philanthropist Avery Fisher, who donated $10.5 million ($59 million today) to the orchestra in 1973. In November 2014, Lincoln Center officials announced Fisher's name would be removed from the Hall so that naming rights could be sold to the highest bidder as part of a $500 million fund-raising campaign to refurbish the Hall. In 2015, the hall was renamed David Geffen Hall after Geffen donated $100 million to the Lincoln Center. The hall underwent renovations in 1976 to address acoustical problems that had existed since it opened. Another smaller renovation attempted to address unresolved problems in 1992. Both projects achieved limited success. In May 2004, the orchestra announced that the building would undergo renovations in 2009, but in June 2006, The New York Times reported that the construction had been delayed until the summer of 2010. By 2012, it became clear that construction would not start before 2017. The shell of the building will be left intact and work will focus on improving the hall's acoustics, modernizing patron amenities and reconfiguring the auditorium. On November 13, 2014, Lincoln Center officials announced their intention to remove Avery Fisher's name from the Hall and sell naming rights to the highest bidder as part of a $500 million fund-raising campaign for its refurbishment. Lincoln Center chairwoman Katherine Farley said, "It will be an opportunity for a major name on a great New York jewel." Fisher's three children agreed to the deal for $15 million. On October 3, 2017, it was announced that existing renovation plans for the Hall had been scrapped. Architects hired the acoustical consulting division of Bolt, Beranek and Newman (BBN) to design the original interior acoustics for the hall. Their acousticians recommended a 2,400 seat "shoebox" design with narrowly spaced parallel sides (similar in shape to the acoustically acclaimed Symphony Hall, Boston). Lincoln Center officials initially agreed with the recommendation, and BBN provided a series of design specifications and recommendations. However, the New York Herald Tribune began a campaign to increase the seating capacity of the new hall and late in the design stage it was expanded to accommodate the critics' desires, invalidating much of BBN's acoustical work. BBN engineers told Lincoln Center management the hall would sound different from their initial intent, but they could not predict what the changes would do. The first of Lincoln Center's buildings to be completed, Philharmonic Hall opened September 23, 1962, to mixed reviews. The concert, featuring Leonard Bernstein, the New York Philharmonic, and a host of operatic stars such as Eileen Farrell and Robert Merrill, was televised live on CBS. The opening week of concerts included performances by a specially invited list of guest orchestras (Boston, Philadelphia, and Cleveland), who regularly appeared at Carnegie Hall each season, as well as the new hall's resident ensemble. Several reporters panned the hall, while at least two conductors praised the acoustics. While the initial intention had been that Philharmonic Hall would replace Carnegie Hall, which could then be demolished, that scenario did not take place. The seating capacity is large (around 2,600 seats) and the sidewalls are too far apart to provide early reflections to the center seats. The ceiling is high to increase reverberation time but the clouds are too high to reinforce early reflections adequately. The bass is weak because the very large stage does not adequately reinforce the low string instruments. 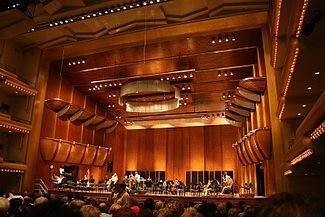 In 1992, under the tenure of Kurt Masur with the New York Philharmonic, several solid maple wood convex surfaces were installed on the side walls and suspended from the ceiling of the stage to improve acoustics. The maple was specially selected to minimize its grain pattern. The new components are filled with fiberglass to deaden vibrations. The ongoing problems with the hall's acoustics eventually led the New York Philharmonic to consider a merger with Carnegie Hall in 2003, which would have returned the Philharmonic to Carnegie Hall for most of its concerts each season. However, both sides abandoned talks after four months. Beginning in 2005 (and continuing in 2006), the Mostly Mozart Festival has experimented with extending the stage for the Mostly Mozart orchestra farther out into the seats from the main stage for the Festival's summer season. David Geffen Hall is used today for many events, both musical and non-musical. As part of its Great Performers series, Lincoln Center presents visiting orchestras in David Geffen Hall, such as the London Symphony Orchestra, the Singapore Symphony Orchestra, the Rotterdam Philharmonic Orchestra, and the Kirov Orchestra of the Mariinsky Theatre. The PBS series Live from Lincoln Center also features performances from the Hall. An early television concert from Philharmonic Hall featured Leonard Bernstein and the New York Philharmonic in one of their Young People's Concerts. It was the first of many concerts televised from Philharmonic Hall, which had been previously televised from Carnegie Hall beginning in 1958. The 1962 program concentrated on concert hall acoustics, and, like the opening night concert, was shown over the CBS television network. It was entitled "The Sound of a Hall". A 1964 performance by Miles Davis at Philharmonic Hall was released on two albums, My Funny Valentine and Four & More. Bob Dylan performed at Philharmonic Hall on October 31, 1964. The concert was released as The Bootleg Series Vol. 6: Bob Dylan Live 1964, Concert at Philharmonic Hall in 2004. Simon & Garfunkel recorded their live album Live from New York City, 1967 here on January 22, 1967. The hall hosted the world premiere of Steven Spielberg's film War Horse on December 4, 2011. ^ a b Matthews, Karen (13 November 2014). "NYC's Lincoln Center to rename Avery Fisher Hall". Washington Times. Associated Press. Retrieved 2015-02-09. ^ Hetrick, Adam (4 March 2015). "Avery Fisher Hall To Be Renamed for Music Mogul David Geffen After $100M Gift". Playbill. Retrieved 2017-02-16. ^ "Naming Wrongs". Slate. 6 March 2015. Retrieved 11 March 2015. ^ Kozinn, Allan (11 June 1992). "Fiddling With the Sound at Avery Fisher Hall". The New York Times. Retrieved 2014-02-21. ^ Pogrebin, Robin (20 May 2004). "New York Philharmonic to Redesign Hall". The New York Times. Retrieved 2014-02-21. ^ Tommasini, Anthony (11 June 2006). "The Philharmonic's Double Challenge". The New York Times. Retrieved 2014-02-21. 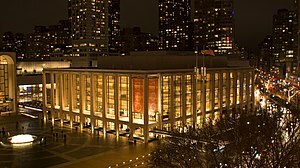 ^ "Lincoln Center for the Performing Arts and the Family of Avery Fisher Announce Landmark Agreement to Enable Renaming of Avery Fisher Hall" (Press release). Lincoln Center. 13 November 2014. Retrieved 13 November 2014. ^ Cooper, Michael (October 3, 2017). "Lincoln Center Scraps a $500 Million Geffen Hall Renovation". The New York Times. p. A1. Retrieved August 28, 2018. ^ Rothstein, Edward (22 May 2004). "If Music Is the Architect, the Results May Be Less Than Melodious". The New York Times. Retrieved 2014-02-21. ^ "1960 Carnegie Hall is saved from demolition". Carnegie Hall Corporation. Retrieved 2014-11-14. ^ Crutchfield, Will (September 28, 1987). "Carnegie Hall vs. Fisher Hall". The New York Times. Retrieved 2015-02-09. ^ Ehle, Robert C. "What Does It Take to Make a Good Hall for Music?". Music Teacher International Magazine. ^ Kozinn, Allan (5 August 1992). "Details Set for Avery Fisher Renovation". The New York Times. Retrieved 2014-02-21. ^ Wise, Brian (2 June 2003). "New York Philharmonic to Carnegie Hall". WNYC. Retrieved 2014-02-21. ^ Blumenthal, Ralph; Pogrebin, Robin (2 June 2003). "The Philharmonic Agrees to Move to Carnegie Hall". The New York Times. Retrieved 2014-02-21. ^ "N.Y. Philharmonic, Carnegie Merger Off". Billboard. Associated Press. 8 October 2003. Retrieved 2014-02-21. ^ Oestreich, James R. (3 May 2005). "An Intimate Stage Plan for the Mostly Mozart Festival". The New York Times. Retrieved 2014-02-21. ^ Tommasini, Anthony (31 August 2005). "New Vigor, New Program, New Stage: The Rejuvenation of Mostly Mozart". The New York Times. Retrieved 2014-02-21. ^ "How A Stressful Night For Miles Davis Spawned Two Classic Albums". NPR. 9 February 2014. Retrieved 2014-02-21. ^ "Walk the Red Carpet and Attend the World Premiere of War Horse". Delta Air Lines. 7 November 2011. Retrieved 2014-02-21. Melone, Deborah; Eric W. Wood (2005). Sound Ideas: Acoustical Consulting at BBN and Acentech. Cambridge, MA: Acentech Incorporated. LCCN 2006920681. "Annals of Architecture: A Better Sound" by Bruce Bliven. New Yorker magazine, November 8, 1976. Wikimedia Commons has media related to David Geffen Hall.